One block from the elaborate American Swedish Institute mansion is a more modest landmark of the Swedish immigrants who made their homes in the Phillips neighborhood. The Messiah Evangelical Lutheran Church, 2501 Columbus Avenue South, was once a social center for the Swedish-Minnesotan community. But over the course of a hundred years, the block has dramatically changed. A building that used to be nestled among single-family and duplex homes is now shadowed by a parking ramp. In an effort to recognize and honor the church’s social importance, as well as the craft used in the design and construction, the church building is currently being considered for local preservation status. Sue Hunter Weir, a Phillips historian who serves on the Minneapolis Heritage Preservation Commission, nominated the building for consideration. Built in 1916, the building was designed by important local architect Harry Wild Jones. His more well-known works include the Lakewood Cemetery Chapel and Butler Square in the Minneapolis Warehouse District. But Jones also took pride in designing affordable, well-crafted churches, according to Hunter Weir. Messiah is one of the few intact examples of Jones’ churches. This church’s red brick exterior makes restrained use of the Gothic Revival style. Inspired by medieval European architecture, the square bell tower, pointed arches, and carved wooden tracery are reminiscent of a castle. But the inside of the building is perhaps the most striking architectural feature. Sunlight streaming through the art-glass windows brings out the warm gleam of oak: oak pews, oak paneling, oak carving, oak ceiling, all soaring up to a crown of oak beams. As Hunter Weir described it, “The interior of Messiah is breath-taking. 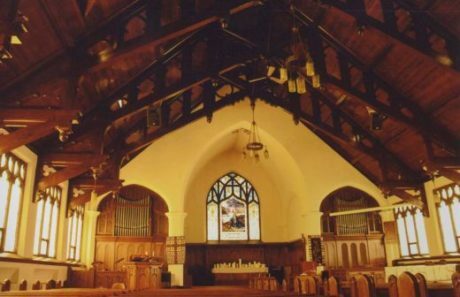 This is not just a building or even just a church, it is art.” The aesthetic value of the building is matched by the value of the social history lived within the building’s walls. As Hunter Weir completes her research, a report will work its way through the Minneapolis Office of Community Planning and Economic Development, and the State Historic Preservation Office. Although historic preservation status doesn’t entirely protect a building from alteration or demolition, it does mean that any major changes must be approved by the Minneapolis Heritage Commission. In coming months, the report will be presented to the Commission, with an opportunity for the community to comment at a public meeting.